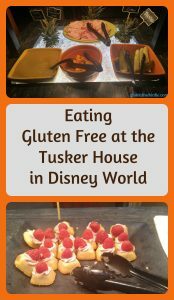 Today’s blog post is about eating dinner at the Tusker House gluten free. Yes, I apologize, that picture of me is awful but I don’t often have the opportunity to get a picture with just me and the characters. For some reason, the lighting just wasn’t cooperating with me that day. The Tusker House, found in the Africa section of Disney’s Animal Kingdom, is a restaurant themed after an African marketplace. It is found in the Harambe Marketplace section of Animal Kingdom across from the Tamu Tamu refreshment stand where they serve Dole Whip soft serve, ice cream sundaes and beer. Tusker House is an African inspired, buffet style restaurant. It has character dining for breakfast, lunch and dinner. The characters include Donald Duck and all his friends. On the day we ate there, we saw Donald Duck, Daisy Duck, Goofy and Mickey Mouse all dressed in their safari gear. Eating at Tusker House gluten free was a pleasant surprise. As you already know, my family is somewhat conservative when it comes to food. The extended family also has a lot of food allergies and most of us have to eat gluten free. 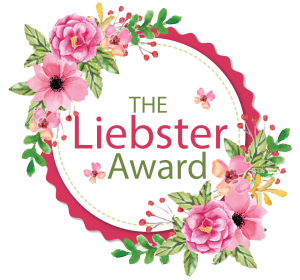 Some because of Celiac disease and others because of gluten intolerance. So when I booked Tusker House, for all 9 of us, I was very nervous. I knew we all wanted to see Rivers of Light at Animal Kingdom. However, my in laws would not want to stand in line for very long to get a seat. I figured the Rivers of Light dining package offered at the Tusker House would be our best bet. This package is only offered at Tusker House and Tiffins. Along with dinner, the package includes a ticket to premium seating at Animal Kingdom’s Rivers of Light show. I knew my in laws would love this. The only problem was that Tiffins is a 2 credit restaurant on the dining plan and we didn’t have enough credits for all 9 of us to go to Tiffins, so I crossed my fingers and made reservations at Tusker House. After checking in we waited about 10 minutes in their outside waiting area for our table. There seemed to be plenty of seating, which isn’t always the case for us (remember we’re 9) in restaurant waiting areas. Once inside, I noticed the theming was excellent. It looked just like I would picture an African marketplace, only with lots of Disney characters roaming around in safari gear. The details were meticulous, with electrical wires (I assume fake) hanging on the ceiling and crates and fabric draped all over. I did find the place very loud but this was not unexpected because being an African marketplace meant no carpeting to dull the sound. We were seated at a long table in a room full of long tables. It must have been the “large group” room because I noticed, as we walked through the restaurant, that there were other rooms filled with smaller tables for families of 2 to 6 people. Once seated we were handed their allergen menu. 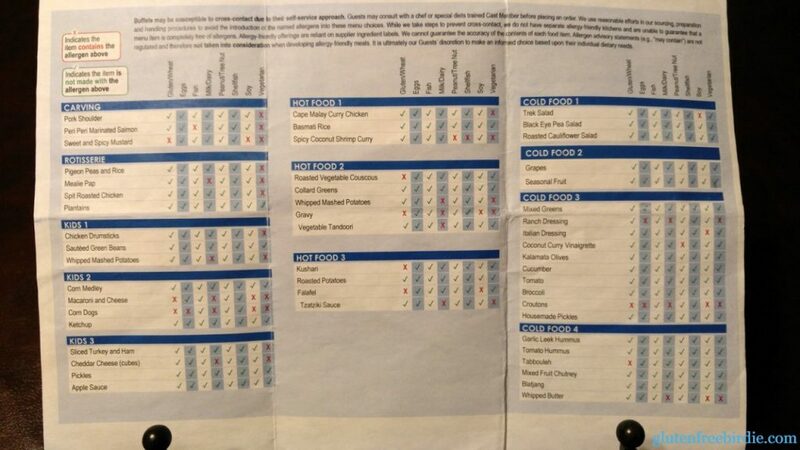 It was laid out similar to the one we received at Hollywood and Vine but the choices were much more interesting. Our waiter asked if we would like to talk to the chef and we said yes, please! The chef came out fairly quickly and took us around the entire buffet pointing out what we could and couldn’t eat. There were a lot of great choices. After my sister in law asked about the dairy in a few dishes, the chef offered to bring out gluten free, dairy free versions of some of them right to the table. These included mashed potatoes and some vegetable dishes. I assume they were originally made with butter. He also brought out a dish of dairy free butter for them to use. When we got back to the table our waiter had already brought us out a large basket of gluten free bread and butter. It was delicious. The choices on the buffet were really great. They included spit roasted chicken, pork shoulder, peri peri marinated salmon, pigeon peas and plantains in the carving and rotisserie stations. I’m not a big fan of salmon but since it was a buffet, I figured I’d try it. Boy was it delicious! I also tried the spit roasted chicken, pork shoulder and pigeon peas and rice. It was all delicious. My original concern was that everything would be spiced in a way that my family wouldn’t like. However, as I looked around, I saw that everyone was really enjoying their meal. At that point I breathed a sigh of relief. 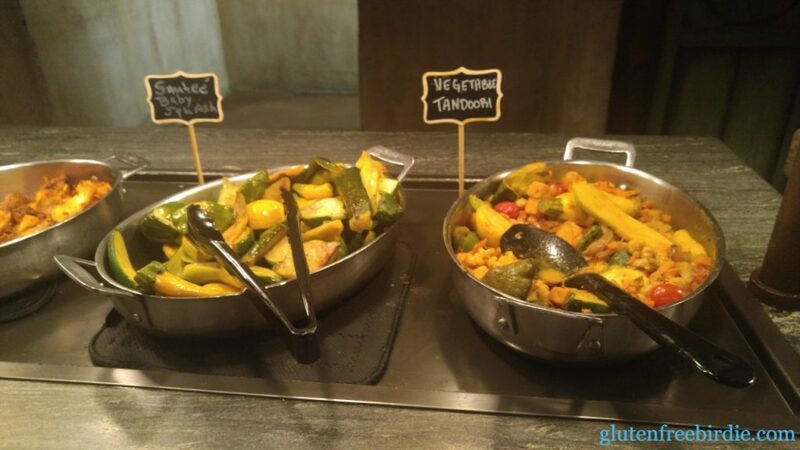 It was really amazing how many gluten free options were available on the buffet. 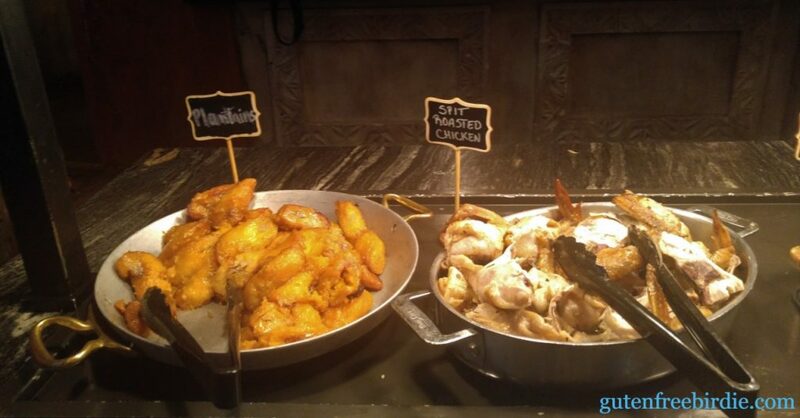 I felt as if this restaurant had more gluten free options on the regular menu than any other buffet restaurant I had ever been to at Disney World. These items included sliced turkey, basmati rice, cape malay curry chicken, spicy coconut shrimp curry, vegetable tandoori, and roasted potatoes. There was also trek salad, black eyed peas salad, roasted cauliflower salad and hummus and salad bars. I ended up having a little bit of everything (just so that I could report back to you, of course!). It would recommend just about everything except the curry. To be fair, I’m not a big fan of curry so it might have been the best curry ever and I still wouldn’t have liked it. The only place we suffered (if you could call it that) was in dessert choices. 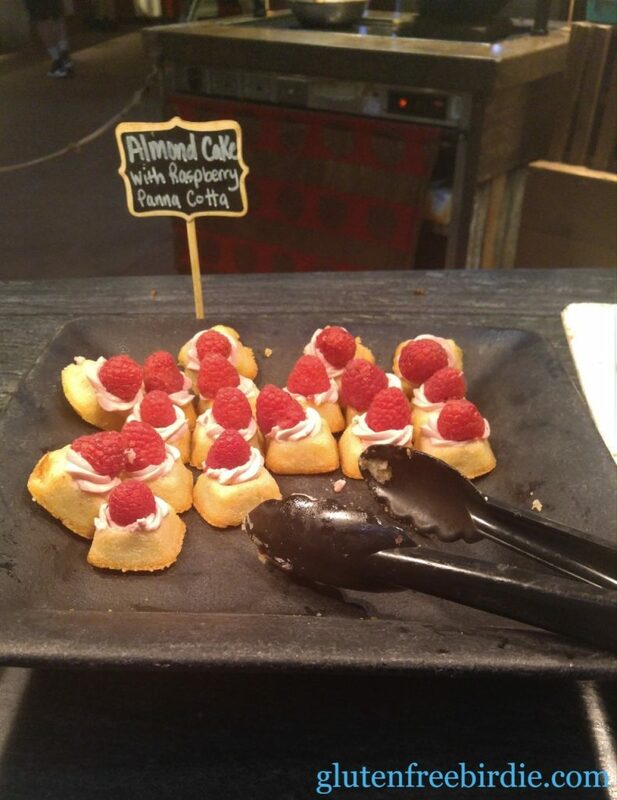 The only option on the buffet was almond cake with raspberry panna cotta or fruit. The cake wasn’t bad (it was actually quite good) but there were so many delicious looking chocolate desserts on the buffet that you definitely had the feeling that you were missing out on something. They also brought out some sorbet for a few of us who were actually still hungry. To be honest, we had all pretty much stuffed ourselves with the rest of the food. The sorbet just wasn’t enticing enough for most of our full stomachs. Overall, I was so happy I had booked the Tusker House. There were numerous gluten free options on the buffet. The chef was very receptive to showing us around and bringing out other dishes to the table as needed. The characters were a lot of fun. Finally, it was a really great deal on the dining plan with the inclusion of the Rivers of Light premium seating passes. Luckily, everyone kept saying the food was delicious. They knew I had been very nervous about this reservation but I don’t think they were saying it just to be nice. I saw them all going up for seconds and thirds. My in laws are really great. They might tell me how great it was to make me feel better but they certainly wouldn’t eat bad food….they’re Italian! 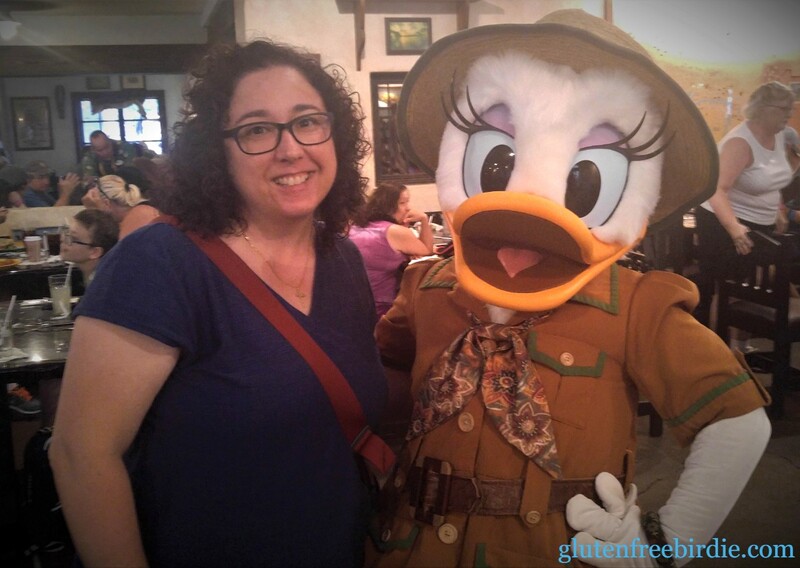 I really wouldn’t hesitate to eat at the Tusker House gluten free again.